THE SKINNY: It started with a sample that came in the mail. The tiny bar of soap was gone in a hurry and I was asked for more. That's how my man's love affair with Dove began. Not only does he love this product, it makes him smell great (but not too smelly). Some of the other men's brands out there have super-strong smells that almost knock you out. This is light enough (I like Extra Fresh) he can use it and then finish with his favorite cologne without making me cringe. And gone is that feminine scent that would linger on his skin when he would would steal my soap out of the shower. His skin is also softer than ever. Dove is a brand I have trusted for yours and I am so excited to see that they have a line for the fellas. Some guys might still have issues associating the Dove brand with women but this is something you should buy for your guy; he will love it! KEEP OR TOSS: Keep. You and your man will love it. 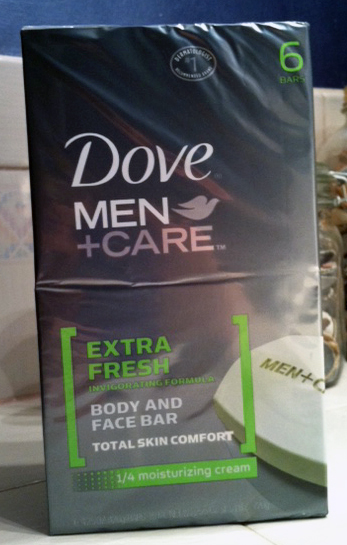 CHECK IT OUT: Dove Men + Care is a fairly new line that has more than just soap. Dove now has deodorants and other body washes for your guy as well.